Beer! Kalamazoo has all of a sudden become a booming craft brew market. 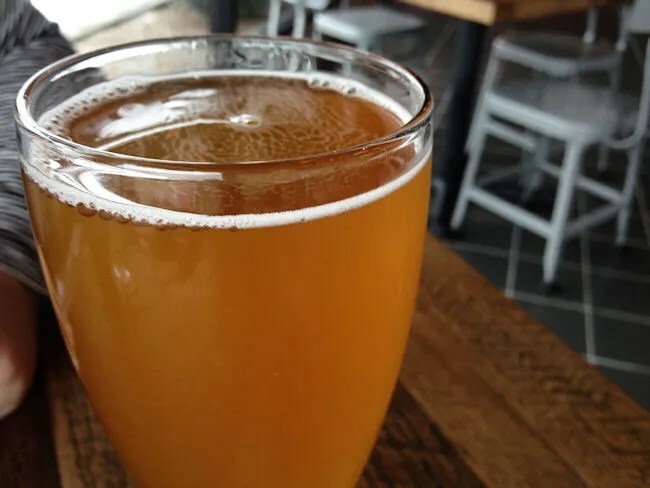 Sure, we’ve been known for craft beer for quite a while, but just recently, there has been a number of craft breweries making a go at it in the Beer City USA Runner-Up. 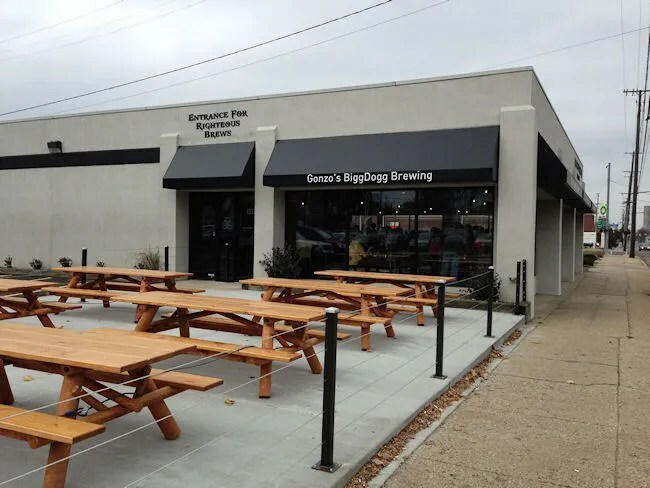 The most recent addition is Gonzo’s BiggDogg Brewing on South Westnedge just to the south of Michigan Avenue in downtown Kalamazoo. The building used to be the Hayes Mazda dealership, but over the last several months, it’s been turned in to an awesome brewpub. J and I were watching cartoons with L on a Saturday morning when J asked if I wanted to go somewhere for lunch. I asked if she thought it would be ok if we took L to Gonzo’s. I wanted to try the beer and I heard the food was fantastic. We figured since it was noon on a Saturday, we’d be ok if we took her. At first glance, parking looks to be an issue, but there’s actually a pretty large lot across Academy Street. There’s a large Gonzo’s sign that lets you know it’s ok to park there. The entrance to the brewpub is on the Academy Street side. You walk past a large patio area with picnic tables that will be great come next spring. We walked in to the dining room and were told to take a seat wherever we’d like. We found a table in the back corner near the window that overlooks Westnedge Avenue. We figured we could put L back there and let her watch the traffic go by in hopes that she wouldn’t bother anyone. Turns out, it didn’t really matter, the pub is pretty loud and I’m sure what little noise she did make was hardly noticeable to anyone else. Once we settled in, a hostess brought over a couple menus and some silverware while our waiter came with a high chair for L. We felt a little better about bringing a baby to a brewery when that was brought to our table. Immediately, before we even ordered drinks, J spotted something on the appetizer part of the menu that she just had to have. While I was looking over the beer menu, J asked if we could get an order of the Goat Cheese Fritters. 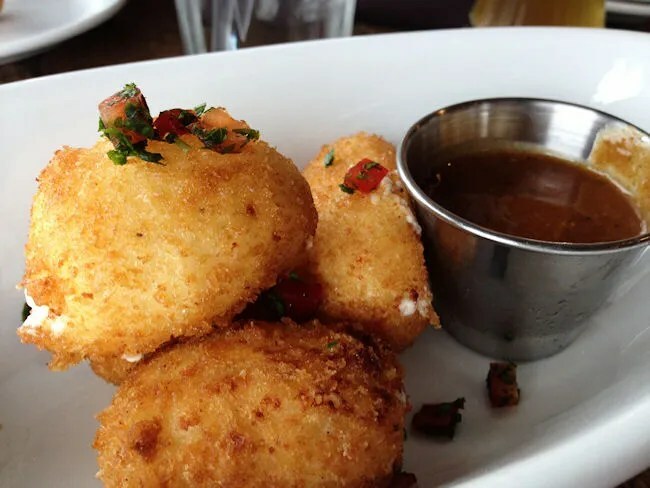 The four fritters are large balls of soft, gooey goat cheese covered in a breading and fried. They are served with a Sweet Habenero dipping sauce. J LOVED the little balls of cheese. She’s a goat cheese fan anyway and the fried aspect along with the sweet yet spicy dipping sauce made for a delightful combination. I’m not a big goat cheese person, but I had to try one. I found them good, but not my thing. J, however, can’t wait to go back for more. The service, even on a pretty busy weekend lunch rush, was incredibly fast. We got the appetizer almost before we got our drinks. As for those drinks, my selection was the Sub-Continental IPA while J got The Premier which is their wheat beer. J’s not a huge beer drinker, but she usually likes wheat’s and she said this one was very tasty…maybe better than Oberon? Lots of good choices for lunch, but I chose the Whole Hog Burger. 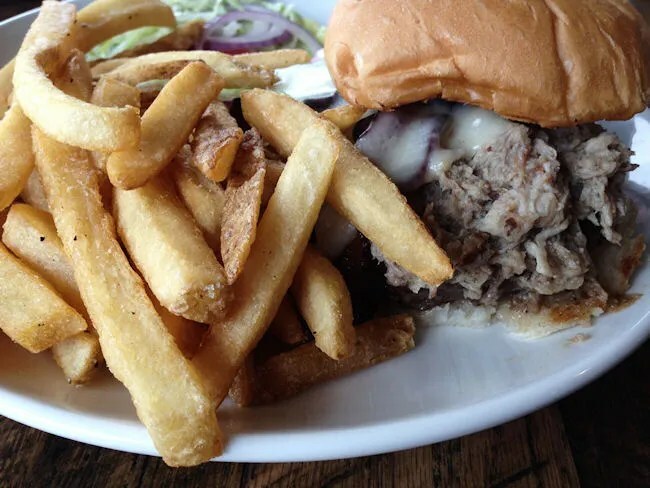 This delicious sandwich comes topped with pulled pork, bacon, and white cheddar. The burger was incredibly juicy and all of the meat made the bun soft and wet. I didn’t hold up very well, but the sandwich was oh-so-good. The pulled pork was served naked with a cup of a sweet BBQ sauce on the side. For the side, I chose fries which were fresh cut, skin-on and very crispy. Since there is no kids menu, L ended up picking fries off my plate even though we had planned on her sharing with mommy. She liked the fries. I liked the fries. J ordered a Pulled Pork Pizza with the intention of sharing with L, but L wasn’t interested and J ended up wanting it all to herself. The pizza at Gonzo’s may just be the best in Kalamazoo. The thin crust pizza, with a corn meal dusting on the crust, comes out of the oven very crispy. 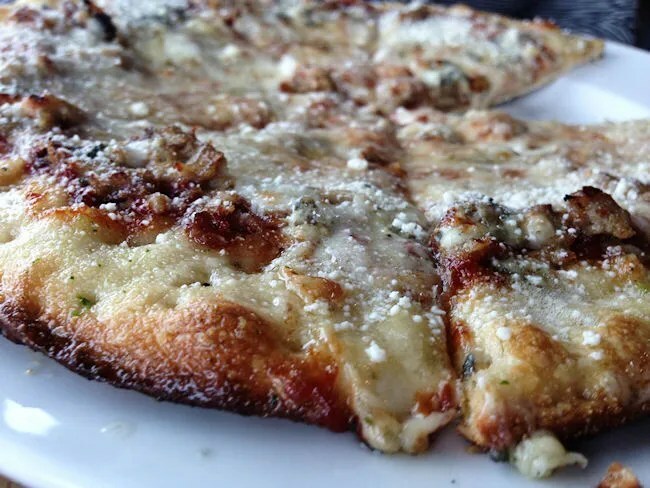 The pulled pork pizza comes topped with pulled pork, mozzarella cheese, bleu cheese, and BBQ sauce. This pizza is incredible. Thin and crispy…just how we like it. Our bill for lunch was right at $40 with two beers and an appetizer. We really wanted to dig in to dessert…which includes a Vanilla Porter Cheesecacke….but we were both stuffed. Next time, I may just start with the dessert. 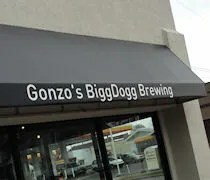 Gonzo’s BiggDogg Brewery is an amazing addition to downtown Kalamazoo. The beer is great. The food is great. The atmosphere is great. The service is great. 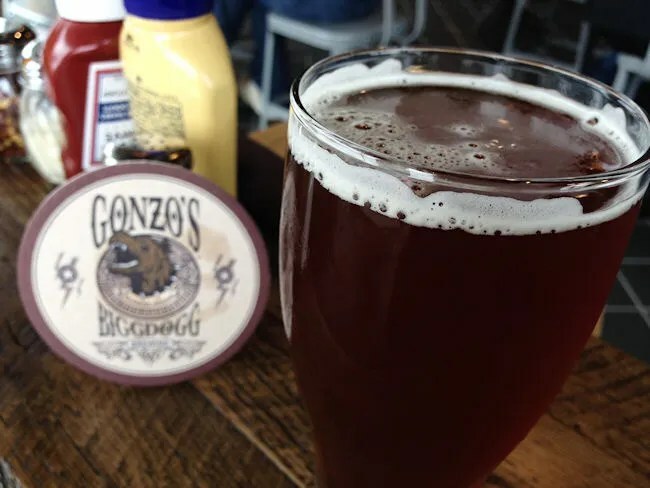 Even a week into their existence, Gonzo’s is making their mark on the craft brew scene. Great article. I really enjoyed the way you storey-told and described your experience. I too really enjoyed The Bigg Dogg. The beer is so incredible I forget how “wonderful” the chef’s food is. I hear he’s from Amway in GR. The city of Kalamazoo is doing an excellent job enabling and promoting the futher development “Craft Brew City” making Kalamazoo a destination city!